Heading to Newcastle? We at VroomVroomVroom can help you find a reliable and cheap car rental for your next holiday. We compare rental cars from major brands, including Avis, Budget, Europcar, Hertz, and Thrifty. No need to check out different websites because you can find all your car hire needs here. Newcastle is a harbour city situated at the mouth of Hunter River. The city was established in 1801 and it is now the second most populated metropolitan area in New South Wales. Coal mining and heavy industries are very developed in the region, but the area is also well known for its beaches and wine, made from grapes grown in nearby Hunter Valley. Save on time by comparing rental cars all at once. You can book a car with us in less than two minutes. Enjoy a wide selection of cars - ranging from economy cars to luxury vehicles. We also compare Newcastle campervan deals as well. Trusted since 2001, we are the experts in rental cars. Real people to help you with your booking and other queries. Contact us for assistance. Generally, the climate in Newcastle is free from extreme temperatures, thus making it a great place to visit all year round. Note that seasons here are the reverse of those in the northern hemisphere - Christmas is in December (summer), while winter is between June and August. The coolest months are from June to August, while the warmest months are from December to February. Just two hours (150 km) south of Sydney, the city can easily be reached by a rental car or campervan hire via the M1 Pacific Motorway. Or if you are entering the city from the north, simply follow the Pacific Highway. The easiest way to collect a rental car when you are arriving by train, is to hop off at Wickham Train Station and make your way to Budget on Tudor Street. The office is approximately 1.5 kms away. Perched between a busy harbor and beautiful beaches, Newcastle is a must-see for every tourist who visits Australia. Young people will have a wonderful time here enjoying the diverse sports and the numerous festivals that are being held here every year. The iconic Merewether beach is one of Australia's most popular surfing spots and is home to the international Surfest surfing competition held annually. We at VroomVroomVroom not only aim to provide you the cheapest Newcastle car hire, we also want to make your trip to the city more memorable. 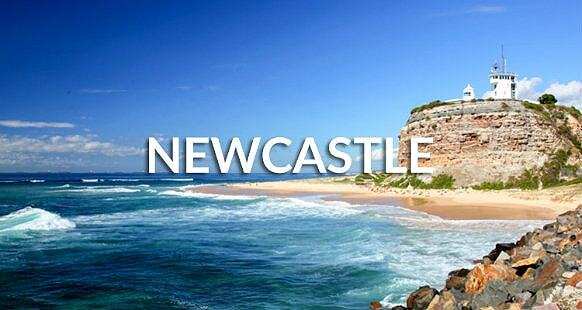 To achieve our goal, we have listed down some of the fun things you can do and places where you can stay in Newcastle. Newcastle Museum is located in the historic Honeysuckle Railway workshops near the old docks, just a 10 minute drive from the Budget car hire pickup location at Tudor Street. The museum houses three permanent major exhibitions and a few exhibits open for a limited time. 'A Newcastle Story' features the local Aboriginal culture and how the city endured tough times like the major earthquake in 1989. 'Fire and Earth' showcases the region's heavy industry and wows visitors with the hourly BHP Steel Making Show. 'Supernova & Mininova' is the museum's science section where visitors can learn interesting things through numerous interactive displays. The museum is an intellectual playground that people of all ages will enjoy. Best of all, admission is free! If you're looking for a fun activity for the whole family, Oakvale Farm is highly recommended. The farm is just a 40 minute drive from the city and is perfect if you want to spend time with your kids on a weekend. Children are encouraged to pet small farm animals along with koalas and baby kangaroos. You and your kids can feed the animals at special enclosures or using the bag of feeds which you can get at the farm's entrance. There are sessions in which your children can bottle feed free-roaming small lambs so you'd better have your camera ready to take cute pictures. Aside from the animals, there is also a playground and BBQ grills where you can cook your lunch. More than 10,000 whales pass the Port Stephens area and the best way to see these gentle giants is to hop on a Moonshadow whale watching cruise. The three hour whale cruise takes you from the bay and out to the open water where whales are spotted. Their vessel, Moonshadow Explorer, is a large and stable catamaran designed to go out in the ocean which makes your trip relatively smooth and enjoyable. Eight species of whale can be seen in the area and if you're lucky, you might even see Migaloo, the famous albino humpback whale. Whale Watch Cruise is only available from May to November while the Dolphin Watch Cruise is available the whole year. The dolphin cruise lasts for an hour and a half with a high success rate in dolphin sightings. Don't feel bad if you don't spot a whale or a dolphin during the trip though, Moonshadow can offer you a free ticket for your next cruise. So head on to Moonshadow Cruises now to experience your ultimate cruise experience in Newcastle & Port Stephens! A trip to Newcastle won't be complete if you don't visit the famous Worimi Sand Dunes. Sand Dune Adventures Tours offers quad biking tours where you can traverse the largest shifting sand dunes in the southern hemisphere. No quad bike experience is necessary as SDA provides excellent training on how to use the high powered bikes. Professional guides will accompany you on the 1 hour tour and there are also tours with extended hours for more quad biking thrills. The tour not only gives you an adrenaline rush, you also get to see sights of beautiful Worimi country and get to learn about the Aboriginal culture. But before you head out, make sure to wear jeans, enclosed shoes, and bring sunglasses and sunblock lotion for protection. If you want to spend the night in the best hotel in town, the perfect place to stay is the Junction Hotel. The award winning hotel is just a few minutes' walk from Bar Beach and a 30-minute drive away from Newcastle Airport. The Junction Hotel offers 9 ultra-modern rooms; each individually designed giving each room a personality of its own. Amenities include free Wi-Fi, free parking, a funky shower in each room, and outstanding customer service. Guests can dine in the restaurant or drink in the Pub tavern located at the ground floor. Cafes, restaurants, bars, and unique shops are also near the hotel. The Clarendon Hotel is a pub-styled hotel situated at central business district. Don't be fooled by that label though, as The Clarendon offers their guests a 4-star experience that is comparable to the standards of modern boutique hotels. Guests can stay in any of the 20 rooms, each equipped with modern facilities including free Wi-Fi, LCD TV, and even a minibar. Situated at the heart of the city, every attraction is within walking distance if not a short drive away. If you're young and outgoing, you'll definitely love this hotel. A stylish pub is at the ground floor and there are numerous bars and restaurants nearby. Bathers Way is a walking track that conveniently links the 3 most popular beaches in Newcastle. With a concrete pathway, families enjoy the walk that not only gives you great views of the coastline, it also takes you through the rugged cliffs that line the coast as well. The Cathedral Church of Christ the Kingwill definitely impress you with its unique Gothic Revival architectural style. The cathedral is located in one of the suburbs, The Hill, and it would be a shame not to visit it since you are already here. Nobbys Head, formerly known as Coal Island, was discovered by Europeans in the 1770s. The Nobbys Head Lirking Lighthouse can be found here, which is a true landmark of the city. From up here you will have a great view of the whole metropolitan area, which will take your breath away. The Newcastle Art Gallery is a great place to learn more about the culture of the country. Here, you will find a great diversity of art collections, exhibited by both historical and contemporary artists. The Newcastle Civic Theatre, mostly known as simply 'The Civic', is an immense auditorium. Every year, famous musicals, concerts, plays and dance events are held here. The Newcastle Regional Show is one of the most famous festivals in the area. It is held ever year in the Newcastle Showground. This event is great to learn more about the city's customs and traditions. Other festivals worth mentioning are The Mattara Festival, The Newcastle Jazz Festival and This Is Not Art. Stockton Beach is only a ferry ride away, unless you want to drive your rental car around the harbour. Stockton is a small township with a beach to call its own. It is well worth spending a day there and walking along the coastline to the old wreck that mesmerizes visitors all the time. Feedback: Quick and no fuss! Feedback: Everything is self explanatory. Avis Newcastle - 50 Clyde St, Hamilton North, NSW. Budget Newcastle - 50 Clyde St, Hamilton North, NSW. Europcar Newcastle City - 20 Denison Street, Newcastle West, NSW. Hertz Newcastle Downtown - Unit 2, 122 Hannell St, Newcastle, NSW.